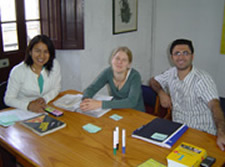 Our Language School was founded in 1995 in Santo Domingo (Dominican Republic) under the name of CCC (Centro Cultural del Caribe) and reopened in 2004 as EDEAQ (Escuela de Español Ari Quipay) in Arequipa (Peru). The EDEAQ operates under the “Resolución Directoral No. 0941” dated 29 March 2004, issued by the Regional Directorate of Education (DREA). It is thus officially recognised by the Peruvian Ministry of Education as a non-governmental educational institution, qualified and entitled to teach Spanish. 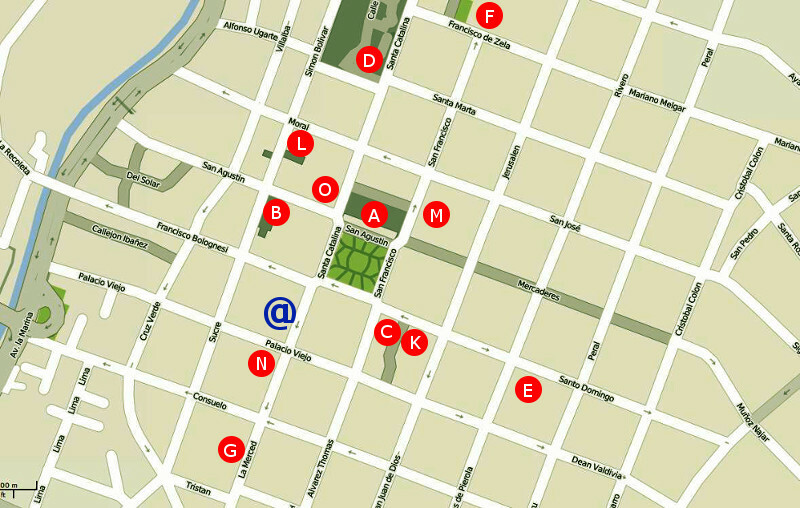 EDEAQ’s location is perhaps “the best place in town” – in the heart of the colonial (city) centre, just half a block (i.e. 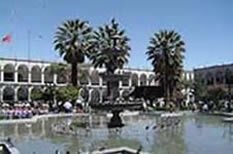 approximately 50 meters) from the “Plaza de Armas” (Main Square/Cathedral Square). The exact address is: Calle La Merced 123 (entrance Hostal Los Andes). 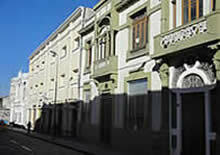 The Calle La Merced is the continuation of the Calle Santa Catalina. Standing on the Plaza de Armas with the Cathedral behind you, the Calle La Merced begins at the right hand corner in front of you. 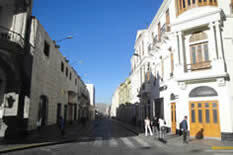 You walk down to this corner: to your right is Puente Bolognesi Street – you walk straight on into the Calle La Merced. You will find No. 123 (the entrance is marked with “Hostal Los Andes”) after approximately 50 meters on the right side, just opposite the Casa de la Cultura de la Universidad Católica Santa Maria, which hosts the famous “Santuarios Andinos UCSM Museum”. January 2010: Students of all age groups (21 to 78) und Nationalities (Australia, Austria, Canada, Germany, Great Britain, the Netherlands, South Korea, Switzerland, United States). EDEAQ’s Swiss management ensures clear/high (i.e. “Swiss”) standards regarding the quality and consistency of the services – and enquiries are answered within 24 hours. 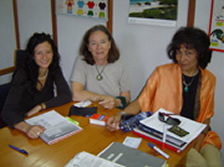 The Acting Managing Director is Mrs. Juana Lourdes Díaz Oviedo de Seelhofer, born in Arequipa, and after numerous years abroad (in Switzerland and several countries of the Americas) back in her hometown since 2002. Lula, as our students call her, is the engine and the fuel of our school, and – by the way – she is fluent in German, French and English. During the first lesson, each student whose performance level is Beginner I/II or higher, completes an assessment test that determines the level at which he/she will be placed. – At the end of the course, each student receives a Certificate of Participation. 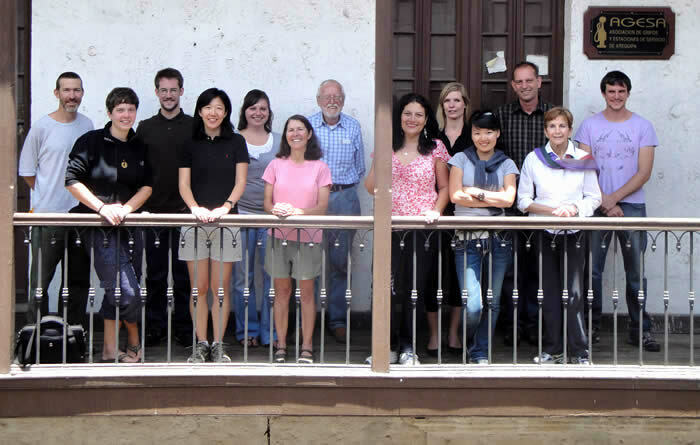 The EDEAQ Teaching Staff (July 2011 – LTR): Christian Zegarra, Patricia Schwarzer-Campano, Joaquín Barrientos, Milagros Quispe, Rosario Gómez, Susan Mamani, Dayana Cano, Juana Lourdes Díaz Oviedo (Acting Managing Director), Fabricio Bedoya, Alejandra Paz, Giancarlo Pinto, Rosa Puma, Virginia Abrill. – Absent: Pedro Moscoso. 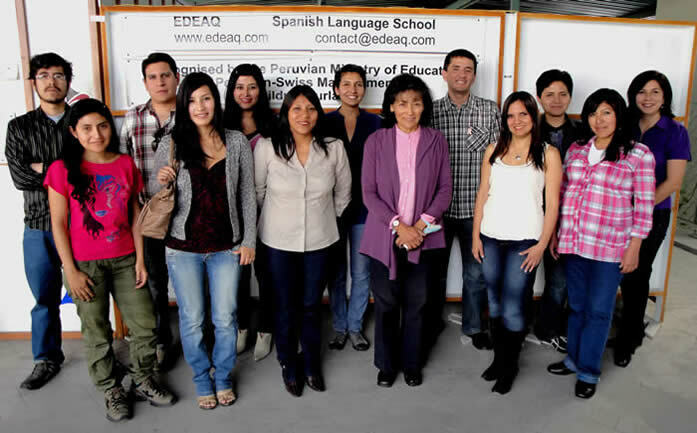 In Peru, the EDEAQ is one of the very few Spanish Language Schools (in Arequipa the only one) which is recognised by the Ministry of Education as a non-governmental educational institution; i.e. the EDEAQ is a legally established, tax paying company, and also licensed by the pertinent Municipal Authorities. Furthermore, its intensive courses are recognised as Bildungsurlaub (“educational leave of absence”) in several German federal states. 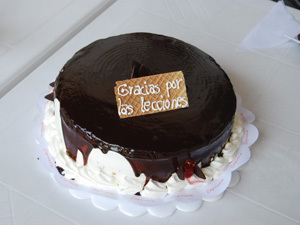 – These are seals of quality which are difficult to be found elsewhere in Peru and the rest of Latin America. Thank you for all your help, I genuinely enjoyed my time at your school. Please extend my gratitude to Milli, Pedro, Joaquin and all the staff for making it such a great experience.